Acts Retirement-Life Communities completed its affiliation with Integrace and its family of communities throughout Maryland this week. 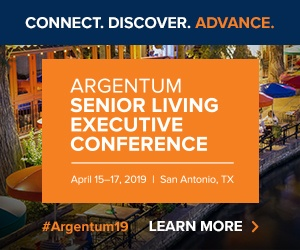 The affiliation brings together two nationally recognized names in the senior living industry under shared leadership and governance. The affiliation was first announced in January. The affiliation gives West Point, Pennsylvania-based Acts entry into the Maryland senior living market and expands its portfolio to 26 campuses in nine states, with over 10,000 residents. Acts is the third-largest multi-site, nonprofit senior living organization in the country. Its combined assets are valued at over $2 billion. The Avamere Family of Companies completed the acquisition of Avamere at Mountain Ridge, a senior living community in South Ogden, Utah. The community offers assisted living and memory care and accommodates 108 residents. This is the 15th senior housing community Avamere has acquired in the past year, as the company has been expanding its portfolio across the U.S. The Ensign Group (Nasdaq: ENSG) completed the acquisition of Rockbrook Memory Care, a 52-unit memory care community in Lewisville, Texas. KeyBank Real Estate Capital’s Carolyn Nazdin arranged a $12.2 million Fannie Mae, first mortgage loan for Sunrise of Leominster in Leominster, Massachusetts. The property is comprised of one, three-story, 70-unit building with 38 assisted living units and 32 memory care units. The non-recourse, fixed-rate loan carries a 10-year interest-only term. Proceeds were used to refinance existing debt. St. Ann’s Community, a senior housing and health services provider in Rochester, New York, acquired The Greens of LeRoy, an independent senior living community located in Genesee County, New York. The community will now be known as St. Ann’s Community at The Greens. Senior Living Investment Brokerage (SLIB) completed the sale of Vista Gardens, a memory care community in San Diego consisting of 71 memory care units and 99 licensed beds. The seller is a local owner who is exiting the industry. The buyer is a Colorado-based private equity group that owns several senior living properties, along with other commercial assets, nationally. The buyer plans to continue building out their senior portfolio. Alec Blanc of SLIB affiliate Monarch Advisors sourced the debt for the transaction, consisting of an $18.1 million loan, including $1.9 million for planned capital expenditures, from a regional commercial bank.